Thermobia domestica, also known as “silverfish” or “firebrats” is the most commonly found species of silverfish on the insect supplier’s list. They belong to the order Thysanura, one of the most primitive orders of insects, with direct ancestors in Jurassic rock layers. Todays’s species does not differ much from those ancestors. Silverfish are small (≤15mm or approx. ½ inch long), very flat and dull- greyish to beige with some darker dorsal markings on some individuals. These insects have a segmented, elongated body, terminating with three long appendages. They have small heads with a well-developed pair of antennae. They primarily live as commensals of humans, often found in dark, moist houses and apartments. They are considered to be pests since they feed on old papers, old books, flakes of old paint and tapestries, yet they are totally harmless to humans and their pets. Only 0.2% of the population is allergic to them, such allergies being generally mild in comparison to allergens found in cockroaches. The latter are also more prone to trigger allergic reactions in humans (≥ 12% of humanity is more or less allergic to cockroaches, and cockroaches may also transport harmful bacteria or fungi, which is not the case with silverfish) (Source: Council of French Allergy Medicine, 2006). If one searches for silverfish on the Internet, there will be a lot more links to get rid of them than to use them as feeders for reptiles! Silverfish can climb rough surfaces such as tapestry or cardboard but are unable to climb glass or PVC. Thus, a starting colony of 100-150 individuals can safely be stored in a cubic 10” plastic or glass container with ventilation at the top. DO NOT collect them yourself, as silverfish concentrate toxic substances from paint and other materials in their metabolism. So, buy a starter colony from an insect retailer on the Internet or at your local reptile store. They shun bright lights and have to be kept in a dark area. 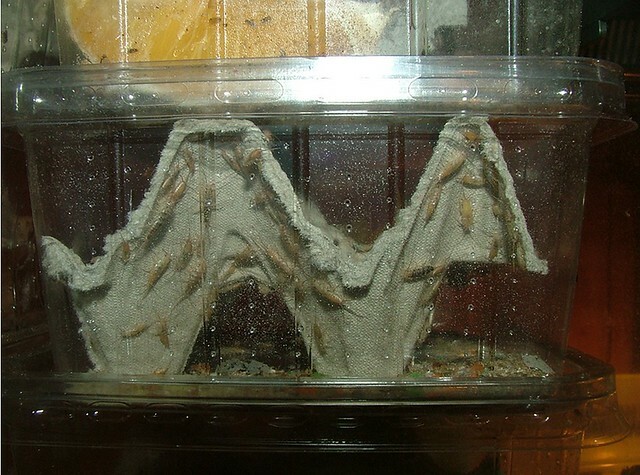 Like crickets, they will need egg crates for hides, and they will also use egg crates to feed. It takes about 3 months for them to start having young, which look like small duplicates of adults; there is no larval stage. Eggs are so tiny they are invisible to the human eye. A constant temperature of 82 to 85°F 24 hours a day is optimal, obtainable through a 12 or 16 watt UTH, or by simply storing breeding colonies on top of reptile enclosures. They are sensitive to dehydration and a relative humidity of 70 to 85% is necessary. This can be achieved through occasional light mistings, i.e. twice a week. Unlike crickets, they do not attack or prey on each other. I have noticed a very low percentage of losses in properly kept colonies. They should be fed fish flakes from pet stores and wheat bran. I add to their diet a teaspoon of powdered sugar in each box, Miner-all I® for a proper intake of vitamin D3, calcium and a variety of minerals. They will ignore fresh fruit and vegetables. data obtained through my local veterinarian laboratory in Caen, France, based on a sample of 1.2 grams of live silverfishes properly gutloaded. This table shows a reasonable level of protein, making risks of gout in predators close to nil, a phosphocalcic ratio of 2.5 — the desired ratio for reptiles is 2 or more— and a very adequate level of vitamin D3. Provitamin A was found in negligible quantities, and vitamin C was found at a level of 200 mg/kg. Their chitin represents only 30% of chitin found in Blaptica dubia roaches. 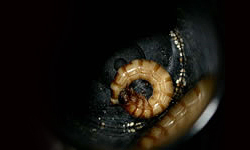 Thus, these insects are particularly interesting as far as their nutritional value goes to feed small species of geckos. 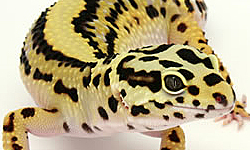 However they are fast-moving and will seek refuge in the darkest places inside geckos’ enclosures. I have successfully fed them to geckos of the genera Hemidactylus, Afroedura, Ptenopus, Pachydactylus, Tropiocolotes. Some renowned day gecko keepers use them with some success on small Phelsuma species and members of the Lygodactylus genus (Pr. B. Röll, pers. comm.). 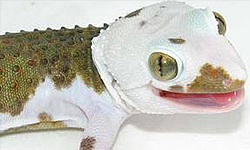 They are not adapted to either slow-moving geckos or large species with a vast mouth cavity such as tokay geckos, leopard geckos, crested and gargoyle geckos, African fat-tail geckos or leaf-tails. With tiny juveniles of fast-moving gecko species, silverfish are particularly well-adapted as feeders. Simply offer the ±3-4 mm silverfish offspring, which are much more resistant than pinhead (newborn) crickets. Genera or species such as mourning geckos (Lepidodactylus lugubris), Saurodactylus sp., Nephurus sp. hatchlings, small Gehyra species, to quote only a few, will undoubtedly prey on them. Just make sure the silverfish do not gather in an inaccessible corner of the enclosure. As opposed to crickets, they are absolutely harmless to geckos unless too many silverfish are left wandering inside the geckos’ enclosures, which may induce some unwanted stress, so offer just enough prey to be eaten overnight. Last but not least, so far no disease has caused any issue with silverfishes, thus keepers of small gecko species might consider them as a staple diet which will not cause the same issues as domestic crickets in the US and their well-known virus. -Dr. Vét. BROGARD J., 1992, Les maladies des reptiles, Ed. du Point vétérinaire, Maisons-Alfort ,2e ed. ,320 pp. Good information! To add to your guidance… Misting is not even necessary if you use a covered bowl of water (using a mesh). There will still be enough water for them and you have reduced problems with fungus. To my opinion you should watch out for your silverfish eating the paper and then being fed to ypur geckos. I can imagine the problems it will cause when toxica from the egg crates will still be concentrated after ingestion by silverfish and problems with digestion of the paper by geckos. I enjoyed your article on breeding silverfish as feeders and appreciated the warning not to collect them. We have loads of them in our stone basement in the spring. I have been unable to find a supplier that sells silverfish in the US… any recommendations?